Datasoft Implementation Methodology provides a framework that helps mitigate implementation associated risks while meeting milestones and deliverables on time and on budget. Our team of knowledgeable and experienced implementation specialists engage a disciplined methodology enables you to implement Datasoft FXOffice effectively achieving rapid measurable success. Cornerstones of our methodology are fully transparent costing and schedule control. Your Company can immediately benefit from all aspects of FXOffice from the onset. Control implementation costs and schedules during every level. 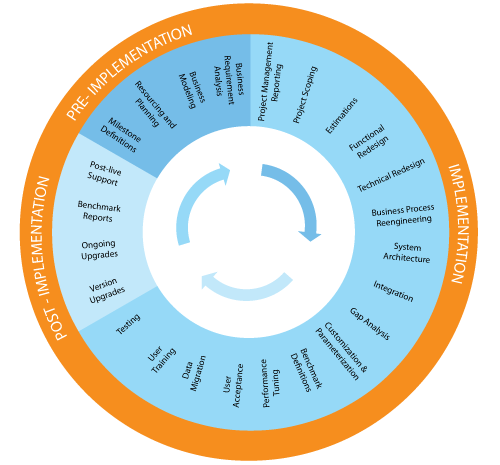 We also offer fast start programs at an accelerated pace through pre-defined implementation templates, system parameters and processes. This approach gives you rapid implementation times, lower implementation overhead and turn-key ROI and is applicable for companies that are willing to subscribe to our out-of-the box Business Modeling practices.